The content of this website is for information purposes only. Nothing on this website constitutes legal advice, or is a substitute for obtaining legal counsel or advice. The information on this website does not create a solicitor-client relationship. Henley & Straub LLP assumes no liability or responsibility for any errors or omissions in any of the content found on this website. Users of this website should note that sending confidential information via e-mail is not secure. Sending or receiving electronic information does not create a solicitor-client relationship. 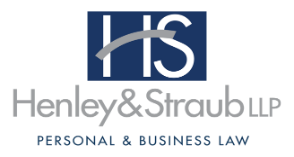 Henley & Straub LLP and its contractors or employees may use your IP address to assist in the administration of this website. We will never sell, trade, or rent this personal information to other parties. Henley & Straub LLP may provide from time to time aggregate statistics regarding traffic on this website, and additional website-related information, to reputable third party service providers, but these statistics will never include personally identifying information and will only be used to optimize the functionality and accessibility of this website. By using this website, you consent to the collection and use of your information as described above.